At one time, heavy use of the pesticide DDT led to a sharp decline in the bald eagle population. The pesticide collected in fish, the bald eagle's primary food source. It weakened the shells of bald eagle eggs and led to reproductive difficulties in the birds. Since those days, the bald eagle's numbers have rebounded, and thanks to successful breeding there are now an estimated 250,000 bald eagles living in the wild. Bald eagles reach sexual maturity between 4 and 5 years old, at which time they become primarily preoccupied with finding a mate. During mating season, bald eagles engage in impressive aerial displays where they soar to great heights and lock talons, cartwheeling toward the earth while joined together. They release their lock and fly apart just before hitting the ground. Contrary to popular belief, copulation doesn't take place in the air. Instead, bald eagles will mate on a tree branch or on the ground. Once a mate is selected, bald eagles mate for life. Males and females collect nest-building materials equally, although the female is the architect and interior designer. Sticks, twigs and branches become interwoven at the top of a sturdy tree. Bald eagle nests, shaped by the branches supporting them, are notoriously enormous in size. The largest known bald eagle nest, located in St. Petersburg, Florida, was nearly 10 feet across and 20 feet tall, and weighed more than 2 tons. A more moderate-sized bald eagle nest spans between 5 and 9 feet in diameter, standing 2 to 4 feet tall. The eagles prepare the nest to receive eggs by lining its interior with moss or grass and downy feathers. Upon successful mating, the female will lay her first egg in the nest within five to 10 days. A few days later she may lay another egg, and possibly even a third egg a few days after the second. A bald eagle clutch normally consists of one to three speckled, off-white or buff colored eggs. Once in the nest, incubation is shared by both parents for the roughly 35 days it takes for them to hatch. One parent or another remains on the eggs 98 percent of the time, to keep the eggs warm and to fend off would-be predators such as squirrels or other large birds. In Decorah, Iowa, a bald eagle nest became the subject of a live-streaming web cam. 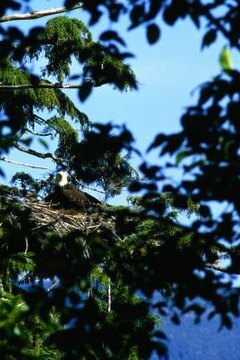 The world became enthralled watching the bonded pair of bald eagles mate, nest and raise their young. In 2011, live viewing of the Decorah eagles reached 250,000 viewers, making them the most-watched live feed in the world. The web cam still keeps a watchful eye on the nest, allowing humans to catch a glimpse of the private world of nesting eagles. What Kind of Eagles Live in Michigan?